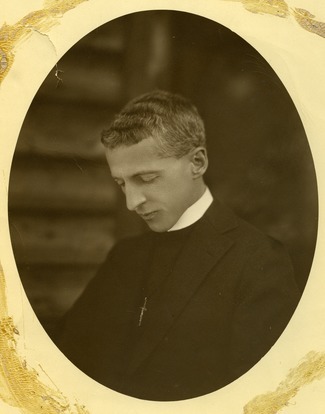 Ordained as an Episcopal priest in 1911, Dr. Clark accepted the position of director of the Chapel of the Comforter in Greenwich Village, New York, a mission that abandoned its traditional Christian practices in favor of the teachings of theosophy. A prolific writer and lecturer, Clark stressed in his work the similarities between Eastern and Western religions, and emphasized his belief that unity among religions would bring about a spiritual re-awakening throughout the world. After serving as director of the Chapel of the Comforter for more than forty years, Clark retired in 1950. Clark's papers document his career as a professor of English, Episcopal priest, Theosophist, and Director of the Chapel of the Comforter in Greenwich Village, N.Y. Consisting of correspondence, lecture notes, and selected writings, the collection chronicles Clark's religious beliefs and his passion for the poetry of Emily Dickinson. Born in Baltimore, Md., in 1875, Clarence Carroll Clark graduated from Johns Hopkins University in 1896 with a degree in English literature before earning his doctorate at Yale (1903). Although he began on a standard course into the academy, teaching literature at Bryn Mawr College from 1903 to 1911 and rising to the rank of assistant professor, Clark left his scholarship behind to enter the ministry. Ordained as an Episcopal priest by the Episcopal Diocese of New York in 1911, Clark soon took up his duties at the Chapel of the Comforter on Horatio Street in Greenwich Village, New York, pastoring to a working class flock. Although founded as a traditional Christian mission sixty years before, the Chapel of the Comforter had become highly influenced by Theosophical thought by 1909, and Clark's was given responsibility not only for leading the chapel, but a theosophical parochial school at the request of some prominent members, including Genevieve Griscom, H. B. Mitchell, and Ernest Temple Hargrove, former president of the Theosophical Society of America. Clark remained in ministry at the Chapel of the Comforter until he retired in 1950, becoming a prolific writer and lecturer on literary topics, weaving the themes of faith, interfaith dialog, spirituality, and world religions into his work. Publishing regularly in the Theosophical Quarterly, Clark explored the similarities of Eastern and Western religious traditions, emphasizing the unity of religions as a spark for a greater spiritual awakening in the world. Clark's grounding in literature and love for poetry also led him to become an interpreter of Emily Dickinson, about whom he wrote "only a deeply religious person can understand and appreciate" her. Following his retirement in 1950 and the closure of the Chapel of the Comforter, Clark moved uptown into the Episcopal Retirement Home near Columbia University. He continued his studies and writing for several years, delivering a memorial service for Ray Ethan Torrey, a beloved botany professor at the University of Massachusetts Amherst and a student of Theosophy. Clark's parishioners endowed a Center for the Study of World Religions at Harvard in 1958. At the age of 89, Clark moved to a retirement cottage in Pomfret, Conn., that had been built for him by one of his former parishioners, George Woodbridge. Clark remained there until his death in May 1973. Gift of Raymond P. Tripp, Jr., Aug. 1997. Some photographs from the collection have been digitized and may be viewed online in Credo. Cite as: Clarence Carroll Clark Papers (MS 393). Special Collections and University Archives, University of Massachusetts Amherst Libraries.